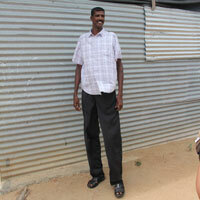 Gunasingham Kasendran is considered the tallest man in the country. Standing at a staggering 7 ft 3 inch, he is currently part of the government rehabilitation programme for ex-LTTE combatants at the Rehabilitation Centre in Kandakadu, in the Polonnaruwa District. A rather shy and soft spoken man, Kasendran shuns public functions, which draw attention to him and instead prefers to lead a rather solitary life, even at the camp. He was a former LTTE member, subsequent to his surrender to the Sri Lankan armed forces on 17 May 2009 was under detention at the Bossa Camp. He was later transferred to the Kandakadu Rehabilitation Centre on 22 February 2012. He is expected to complete, one year of vocational training and rehabilitation at the Kandakadu Rehabilitation Centre before he can be released next year. Kasendran, 33-years of age and from Chavakachcheri in Jaffna is the father of a three-year-old. However due to his height, he suffers from a heart condition that prevents him from engaging in strenuous activities. Speaking to Ceylon Today, he said his gigantic height poses many obstacles in his daily activities. “It is difficult for me to travel in a regular bus, as getting in and off is also a great ordeal due to height. Many doorways too are hard to maneuver through and I have to crouch through many of the passage ways. “Even health wise, I am suffering from a heart condition and I feel tired and exhausted even when I engage in regular activities. If I walk for long periods or stand for too long, I feel a lot of pain in my limbs. If I sit for long periods, I suffer from excruciating back pains. Furthermore, whenever I go out, people just stare at me, which draws a lot of attention and makes me uncomfortable,” he said.